The Fed has kept the market in a holding pattern for several weeks now, but the moment of truth is finally here. Bulls are anxiously awaiting Word of Liquidity to be handed down from On High tomorrow when The Great Wizard speaks. The bears are betting, of course, that Bernanke will emerge from the meeting and see his shadow, which, legend has it, predicts we'll have six more quarters of bear market. It will be interesting to see what happens, especially in light of recent developments such as The Strongly-Worded Letter from the GOP, in which they urge Bernanke to refrain from turning the dollar into a competitive brand of toilet paper. Personally, I don't believe that more quantitative easing is forthcoming, at least not in the immediate future (I've been wrong before, though). I think what we'll get instead is something more along the lines of a Strong Statement from the Fed, reaffirming their commitment to keep doing a bang-up job of ruining our children's futures as much as possible with their Keynesian policies without actually printing any more money... just yet. This is what the charts are telling me, anyway. Although there are other possibilities, such as the possibility that the recent crash was just the b-wave of a 3-3-5 correction off the March '09 bottom, and we have one more intermediate-term rally waiting in the wings. But again, based on the charts, I view that as a long shot. 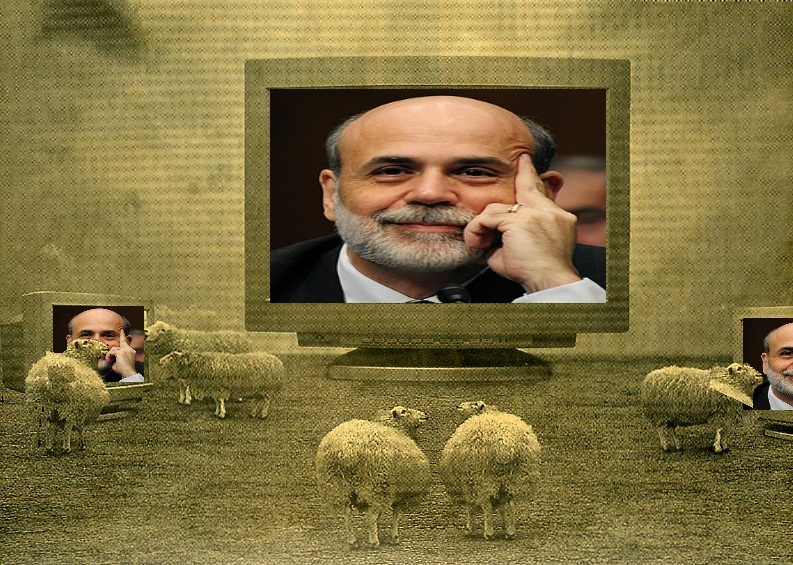 Contrary to my view, the market is hanging its hope on the idea that Emperor Ben will announce QE3: In 3D Coming Soon to a Primary Dealer Near You, so we can get enough liquidity sloshing around to prop this pig up for another few months. It's pretty bad when the bulls last and only hope rests on the continuation of the QE bubble: forget the real economy, or housing, or jobs, or production, or anything else with any basis in reality, such as Europe. It never ceases to amaze me the ability people have, both individually and collectively, to lie to themselves. What got us into this mess in the first place was loose monetary policy and the series of bubbles it created. Only a delusional person -- or nation -- would believe that a lasting solution is imminent if only we keep applying more of the same policies. I have a chart, but honestly I think the reason the last couple weeks have been so difficult to count is because the market hasn't quite made up its mind yet, so it's keeping its options open to several possibilities. It seems very likely that this stalemate will finally come to an end -- and we will again gain clarity to the market's intentions -- after we get word from Bailout Ben.